#TravelTuesday with Guest Photographer Bob Wick to California’s Humboldt Coast! A five hour drive north of San Francisco, California’s fog-shrouded Humboldt Coast is a land apart from the traffic and bustle of California’s urban centers. 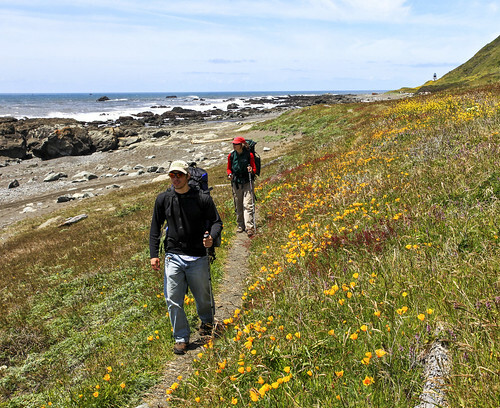 There are year-round photography opportunities here ranging from crashing winter storm waves to brilliant spring wildflowers; from towering redwoods to rushing mountain streams. The weather can be fickle so be prepared to adjust your photography for conditions. Here are three of my favorite places that can all be fit into one multi-day trip. The King Range National Conservation Area is the largest patch of wilderness coastline on the west coast. 4,000 foot peaks rise majestically from the surf and almost 100 miles of hiking trails beckon to day hikers and backpackers. One of my favorite spring hikes is to the historic Punta Gorda Lighthouse. Fields of poppies and lupine peak here in May and last till early June. Photo tip: Bring a long telephoto lens and hike a bit further south to capture a rare colony of Stellar sea lions on the offshore rocks. For a good wildlife shot, always focus on the eyes to make sure they are sharp. Don’t be afraid to shoot many exposures to increase your opportunity to capture interesting behaviors. An hour to the north, the Headwaters Forest Reserve encompasses the last large tract of old-growth redwoods to be placed under public protection. A level hiking trail along Elk River allows you to view restoration work and second-growth redwood along a moss shrouded stream corridor. If you are more adventurous, take the 9 mile round-trip trail to enjoy a taste of primeval old growth redwood. Photo tip: Photography at Headwaters is best on grey foggy or rainy days when soft light and wet vegetation brings out the emerald green colors of the vegetation. Find a point of interest to make your photo stand out. It might be a path winding through the trees, or a trillium blooming among the ferns. Also, consider having a person in the photo to lend scale to the massive trees. Your trip won’t be complete until you head twenty miles further up the coast is the picturesque village of Trinidad. Its coastline is framed by offshore rocks and islands that make up a particularly majestic slice of the California Coastal National Monument. The area is a wildlife viewer and photographers dream. Birds such as black oystercatchers ply the shoreline rocks while seals and sea lions haul out just offshore. On the larger rocks, further offshore, thousands of marine birds nest in spring and summer. Photo tip: Time your photography at low tide along rocky coastlines like those in Trinidad and tide-pool life on the rocks will add interest to the foreground. Make sure to wipe your camera and lenses down after seacoast photography to remove salt residue.